Paste tomatoes: The secret to amazing homemade tomato sauce. The right kind of tomato to use in your tomato sauce. Roma tomatoes are perfect for paste. I don’t have any hard numbers on how Americans consume their tomatoes, but I feel safe in conjecturing that by and large we eat the fresh ones raw and cook the canned ones. This at least was one of my best practices, a bit of uninterrogated conventional wisdom that I followed until recently, when my garden produced a sudden glut of Roma tomatoes. I’d always found Romas to be too mealy and bland for fresh eating, so I had no qualms about chopping them up to make a quick, simple sauce. I sliced a couple cloves of garlic—ineptly, with none of the Goodfellas-in-jail precision of Paul Sorvino—started them sautéing in olive oil, added the tomatoes with a pinch of salt and sugar and then, like a bad cook, left the kitchen and went about my business. When I returned after sending some emails, my bog-standard Romas had been transformed into one of the best sauces I’d ever tasted: a thick, rich paste with a tanginess that set my head vibrating. I hadn’t done anything other than leave the room, but the results were superior, in all imaginable ways, to anything I’d ever made with more care and attention (not to mention seasoning) using canned tomatoes. More remarkable than the flavor was the texture, thick and viscous, almost chewy. I turned to Harold McGee’s On Food and Cooking for an explanation: It turns out calcium salts, an additive that keeps canned tomatoes from being pummeled to a mush during processing and shipping, also prevent them from disintegrating so lusciously when cooked. So, yes, you should cook your garden tomatoes, though there is a hitch: Not all of them will respond as magically to heat. But identifying the right ones is easy. For our purposes, there are two kinds of tomatoes: paste tomatoes (the ones you should make sauce out of) and non-paste tomatoes. All the other overlapping categories—determinate, indeterminate; stuffer, slicer, griller; beefsteak, cherry, globe—are irrelevant. Any tomato that is elongated is probably a paste tomato, as is any with plum or (naturally) paste in its name. Romas are paste tomatoes, which explains why fresh ones taste so mediocre, even at their peak of ripeness. Like all paste tomatoes, Romas are simply not meant to be eaten raw. They were created, through breeding, to be cooked. The parent of most modern paste tomatoes is Italy’s long-established San Marzano. Tomato pro Amy Goldman reckons the San Marzano is “the most important industrial tomato of the 20th century,” as its commercial introduction in 1926 provided canneries with a sturdy, flawless subject, and breeders with genes they’d be raiding for decades. The canning industry eventually replaced the San Marzano with blander hybrids that had better resistance to disease and rot and were easier to harvest by machine; meanwhile, the Agriculture Department crossed the San Marzano with two other varieties (one of them itself a San Marzano crossing) and, in the mid-1950s, introduced the Roma tomato. Because of paste tomatoes’ dual nature, both of these conflicting judgments are sound. What gives fresh-eating tomatoes their thesaurus-exhausting exquisiteness of flavor is the jelly around the seeds and the high water content. Slice into a Green Zebra or Mortgage Lifter and it’s advisable to have a tea towel nearby to sop up the mess. But paste tomatoes have few seeds, little jelly, and walls that are thick and dry, with a texture reminiscent of the cold, tough tomato rinds that are so traumatizing in side salads. They are generally not very sweet. Cook a paste tomato, as its creators intended us to, and its flaws become virtues. A non-paste tomato is so juicy (i.e., watery) that cooking evaporates almost its entire substance, along with its flavor. The opposite happens when you reduce paste tomatoes: Rather than boiling their qualities away to nothingness, you approach their essence. A well-reduced sauce made from paste tomatoes is so silky that I’ve adopted the fussy, inconvenient steps of blanching and peeling the tomatoes beforehand, so that not even a fleck of tomato skin spoils the sauce’s texture. You’ll be wanting the names of some worthy paste tomatoes. By all means: Jersey Devil, Polish Linguisa, Opalka, Hungarian Italian, Goldman’s Italian American, Principe Borghese, Long Tom, the miniature Juliet, and the mighty Amish Paste. If you have a garden, plant some next spring, especially if you’re short on space. A lot of paste tomato plants are short, bushy “determinates” that give most of their tomatoes within a few weeks and then go into decline. They are docile as doves. Whereas indeterminate tomato plants bear fruit continually throughout the summer and swell so monstrously that they can pull even a securely staked tomato cage clear out of the ground and flop over, killing themselves and neighboring plants simultaneously. The mild heresy of cooking garden tomatoes has lured me into another, more troubling transgression: replacing heirlooms with commercial hybrids, at least for cooking. For fresh-eating tomatoes, there’s no doubt that you should be growing heirloom varieties, because, sorry y’all, they do taste better than modern hybrids, ceteris paribus. 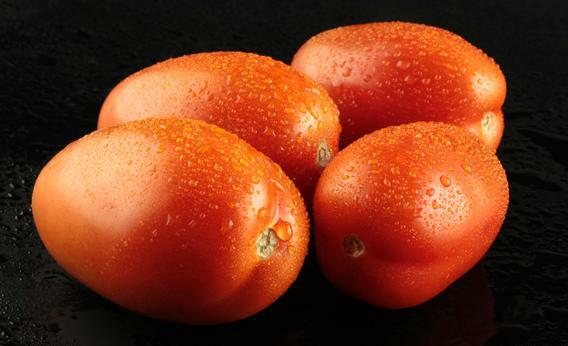 (The same mutation that gives hybrids their pristine red skins also suppresses the production of the compounds that give a ripe tomato its most elusive and complex flavors.) But with paste tomatoes, it doesn’t matter as much. The process of cooking can wash out some of the coarser differences between hybrids and heirlooms, and indeed between ripe and unripe. If you’re skeptical, I recommend the following experiment: Make two sauces simultaneously, one from heirloom paste tomatoes, another from ripe, store-bought Romas. When I did this a few weeks ago, I noticed a difference—the sauce made from the heirlooms was richer, sweeter, and thicker—but it was a difference of maybe a few percentage points, like what you get when you compare chimpanzee and human DNA. (Some may see this as a profound difference, but chimpanzees are pretty amazing animals.) If you grow or can afford to buy heirloom paste tomatoes, go for it. If not, Romas are cheaper, easier to find, and almost as good. But don’t buy canned unless you’re stocking a bomb shelter.